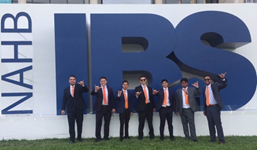 The University of Texas-San Antonio (UTSA) Student Chapter was named 2017 Outstanding Student Chapter of the Year at the International Builders' Show® (IBS) in Orlando, Florida, last week! In its first year of existence, UTSA was recognized as the best among 142 Chapters nation-wide, representing 4,230 students in construction-related degree programs at two- and four-year programs. The UTSA Student Chapter is supported by the Greater San Antonio Builders Association (GSABA). GSABA launched a campaign to completely re-think student chapters in 2017. In March, the association held its first career fair, which drew 75 students from UTSA and St. Philip's College. A month later, GSABA partnered with 84 Lumber, Builders FirstSource and McCoy's Building Supply to hold a playhouse design/build competition that gave UTSA construction students hands-on experience. One of the three student-built playhouses was donated to the Battered Women's and Children's Shelter in San Antonio. The competition also served as a kick-off event for a NAHB Student Chapter, where 40 student members were recruited. In May, the Student Chapter volunteered more than 100 hours at the 2017 GSABA Parade of Homes. In October, UTSA NAHB Student Chapter spearheaded a Hurricane Harvey relief effort by replacing a roof for a family in need in Aransas Pass using 100 percent donated materials from GSABA, TAMKO, Southern Shingles and Bondoc Roofing. In the Fall, GSABA members mentored the young professionals for the IBS Residential Construction Management Competition in Orlando. In its first competition, the UTSA team placed 25th out of 35 competing four-year programs. National Sales and Marketing Council "Ones to Watch"